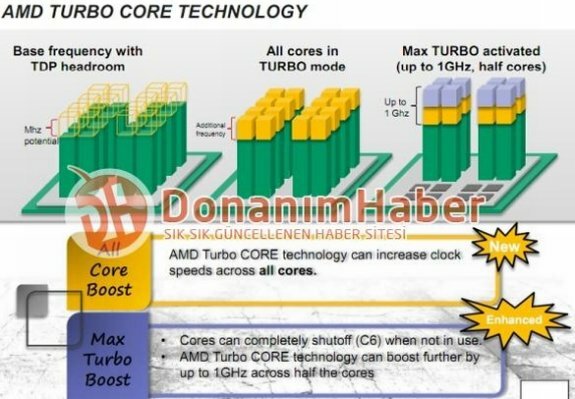 Donanim Haber reports AMD's upcoming FX series processors will feature a new Turbo Core auto-overclocking technology that will boost clock speeds by as much as 1GHz over the chip's advertised clockspeed, within the CPU's TDP headroom. A company slide reveals that FX-series processors can run all cores at nominal speeds (advertised speeds), all cores at a bumped "Turbo" state, or with half the number of cores running at max turbo speeds with up to 1.00 GHz (5.0x BClk multiplier) increase in clock speeds, with the other half the number of cores in C6 state, completely shut off. Turbo Core ensures increased performance in applications that are designed to work with lesser number of cores, most games come in this category.